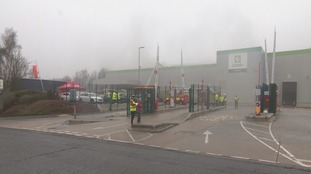 More than 100 Hampshire firefighters have been tackling a blaze at a warehouse in Andover belonging to the online supermarket firm Ocado. Johnny Blaxland was left with a severe brain injury and blind in one eye, but following specialist treatment, he's back to 20/20 vision. Thirteen people have been injured, three seriously, after a double decker bus crashed on a busy road near Basingstoke.